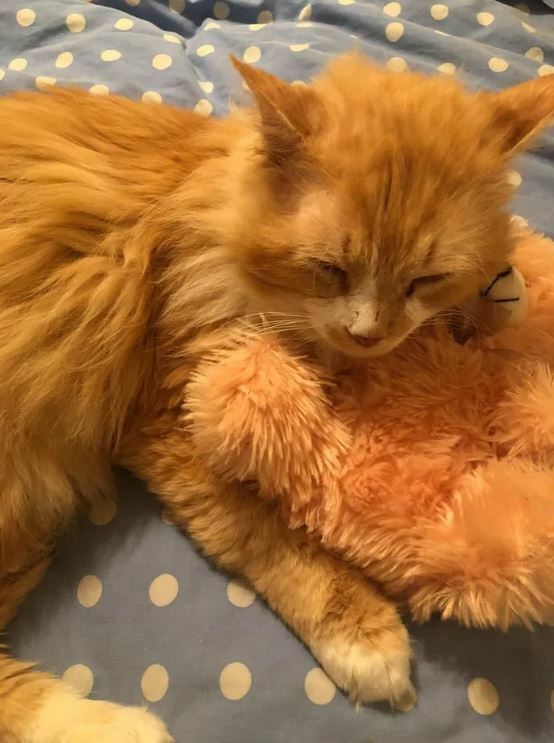 A family in North Carolina recently took in a stray cat from the area, a Ginger kitty who they named Toby. 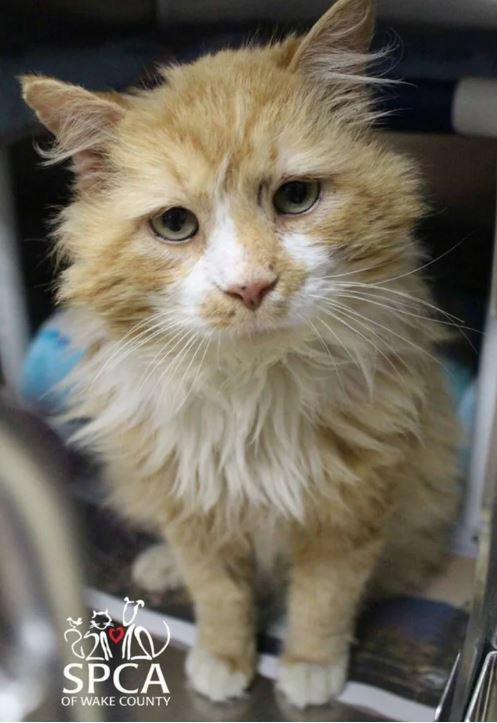 Although Toby loved the family for the kindness they had showed him, he was not accepted by the family’s other cats, who had already lived there for a while. Anyone who has owned cats will know that this shouldn’t be particularly surprising – cats are extremely territorial, and it can take them quite a long time to accept a new presence in the house – especially when it’s another cat. But the owners just didn’t see any way around it, and soon re-homed Toby, giving him to some friends who lived about in another nearby town. This is where it gets emotional. Amazingly, Toby managed to walk home to his previous house, which was a whopping 12 miles away. Sadly, after walking all that way to get back to the family, his loyalty was not rewarded. His previous owners surrendered him to an animal shelter, and bizarrely, asked that he be euthanized. Luckily for Toby, the shelter immediately refused to do so. Instead, they transferred him to another shelter — the SPCA of Wake County, where he was put up for adoption. The SPCA announced this week that Toby had found a new, loving family. “Toby originally showed up to their home as a stray cat, and [Toby and the other cats] weren’t getting along,” she said. They gave him to another family about 12 miles away, but Toby soon took off and showed up back at his former residence. 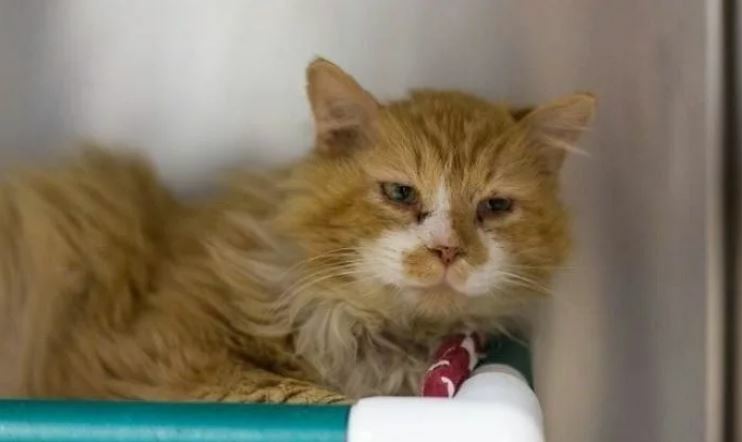 That’s when the people brought him to a local shelter in the Raleigh area. Lynn didn’t know why the family had asked the shelter to euthanize Toby, who is estimated to be about 7 years old. It certainly wasn’t on health grounds. Still, Tara emphasized that it’s a good thing the family brought Toby to an animal shelter, rather than abandoning him in a random location or worse. “I think people’s immediate reaction is to bash the family, rather than saying ‘Hurray, the shelter saved his life,’ or ‘Hurray, he was adopted,’” she said. That’s a good point from Tara – that was certainly my initial reaction. It was more the fact that they suggested he be euthanized, when there seemed no reason for it. 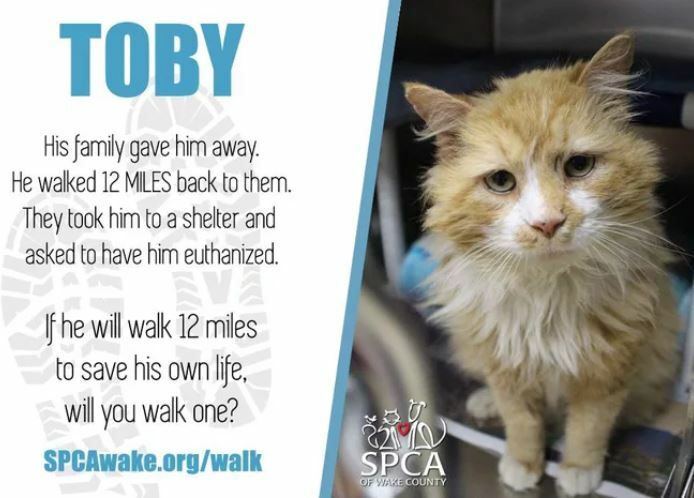 Toby’s story started going viral after the SPCA posted about him on Facebook in early April. After the shelter shared the good news that he had been adopted, local and national news outlets picked up the story. Lynn said Toby, who is “very friendly,” is settling into his new life well. 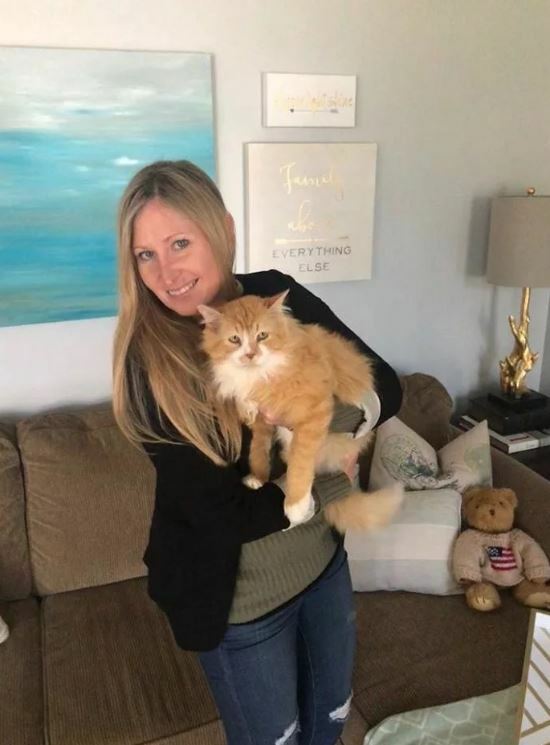 As you can see from the picture above, his new owner loves him very much, and obviously appreciates a kitty as sweet as Toby. He’s even inspired his new family to help even more animals by organizing a team for a local dog-walking event that benefits the SPCA. The now-famous feline also has his own Instagram account, @a.cat.named.toby. In the end, Lynn hopes people are able to see the positive in Toby’s tale. I’m sure Toby is happy now, but it’s a shame he had to go through that ordeal. I’m so glad he got a nice new owner.